Click to download the variety tag sheet. Gift giving is the hallmark of the Christmas season, and gift tags add whimsy and beauty to wrapped packages. There's no reason to spend any of your Christmas budget on gift tags when you can print as many as you like at home for free. 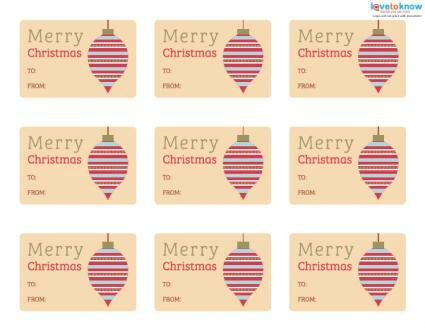 You can download and print the following seven Christmas gift tag sheets using Adobe. One of the sheets includes a variety of labels; all others repeat a single design. All designs feature the sentiment, "Merry Christmas." For downloading and printing tips, check out a guide to Adobe printables. An adorable red-nosed reindeer gift tag is the perfect way to identify presents for young kids or kids at heart. 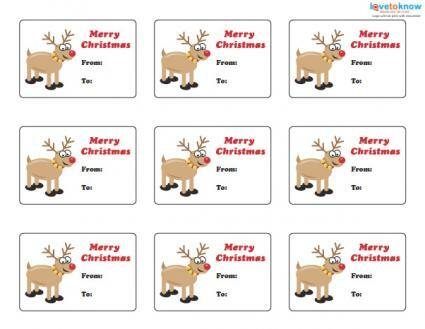 Click to download the reindeer tags. This gift tag sheet features the iconic, jolly-man-in-red himself waving hello and carrying his bag of toys. Click to download the Santa tags. If you're looking for an elegant gift tag, this holly design fits the bill. Click to download the holly tags. The fun red and white stripe pattern on these gifts tags is reminiscent of minty candy canes. Click tod download the candy cane striped tags. 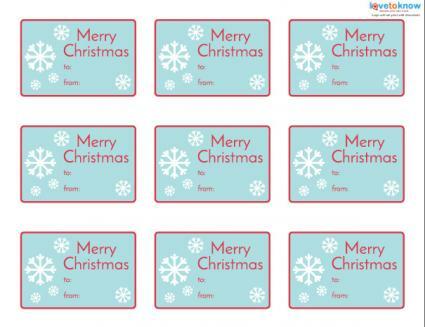 You'll be singing "let it snow, let it snow, let it snow" each time you use one of these cute snowflake gift tags. Click to download the snowflake tags. This classic gift tag featuring a pretty tree ornament is appropriate for any gift on your list. Click to download the ornament tags. Print each sheet on card stock for a sturdier tag. Tape gift tags to packages or hole-punch one corner and attach with ribbon or twine. Eliminate tape altogether by printing each sheet on adhesive sticker paper. Enlarge the tags for use on larger presents. Attach to wrapped, homemade baked goods or gifts-in-a-jar. 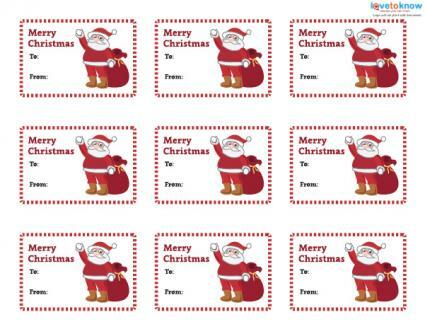 You'll find other free, printable Christmas tags online. 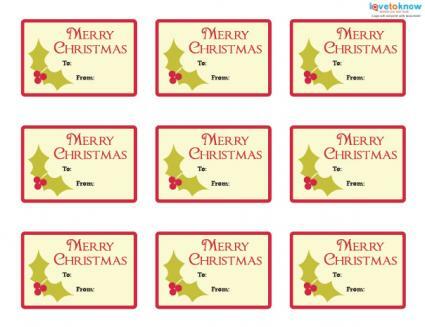 Free Printable Gift Tags offers many gift tags on its site. Design options include classic Christmas icons such as Santa Claus, snowmen, and gingerbread men or religious designs including angels and baby Jesus. Kelli Murray's "Yuletide" Christmas gift tags are works of art. Designs include a peace dove and a snowy wood. 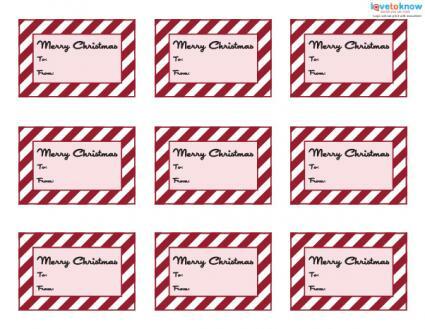 Download and print these sweet, and maybe a bit mischievous, elf gift tags at Jenny Allsorts' website. These gift tags from Design Sponge have a vintage look and include a nutcracker, mittens, and a poinsettia. 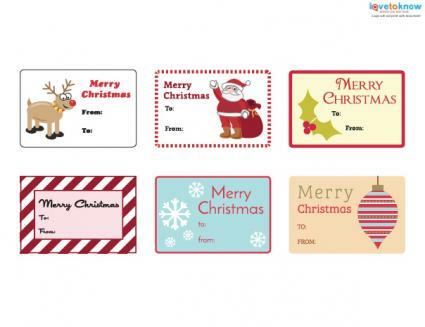 Printing gift tags at home saves you time and money. These festive gift tags rival any coming from Santa's workshop and add a simple, handmade touch to Christmas packages.